It is that time of the year when our young students, moving from class X to class XI have to choose their subject streams. And like so many other years, this year too hordes of students would pick or would be made to pick those subjects which will eventually turn out to be an albatross around their neck. Many parents and family members persuade and almost 'force' their kids to take up those streams which match their status and which is in sync with their pre-defined and biased mindset. That is to say, the science stream is often considered to be an "elite" subject to choose and many parents pressurize their kids to study hard in order to secure good enough marks to be able to get science stream in higher secondary. This extreme level of expectation and an urgent demand to compete and do well in class 10 often leads to extreme stress in the life of a young child and often leads to depression and low self-esteem. Why don't the stakeholders understand that marks or grades cannot be the criterion for subject selection? In fact, many a times, marks or grades in Class X can be quite misleading. It is the Inherent Abilities of the student that should be the criterion for stream selection. What are Inherent Abilities / What is Talent? They are the inborn talents of a student. These talents determine the ease of learning or doing certain types of tasks. Clearly they represent the inherent strengths that each individual has got. When subjects or stream selection is done on the basis of these Abilities, the student finds it easy and joyous to learn those subjects and do well in those subjects. In-fact, operating through ones' area of strengths also results in better performance at work situations as well. 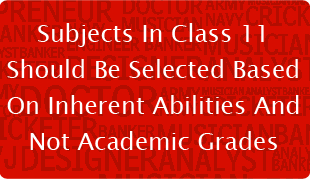 Today, it is easy to find these Inherent Abilities through standardized psychometric test. All one needs to is to take the Aptitude Test and the Personality Test in order to figure out ones' Inherent Abilities. The Central Board of Secondary Education (CBSE) has recognized this long perpetuated flaw in our education system of stream selection based on the marks or grades of the student in earlier classes. They have tried to introduce psychometric mapping of the student for stream selection in the schools affiliated with CBSE. However, the exercise has run into many glitches because of logistical constraints of handling so many students across India through paper-pencil tests. The ideal solution would be to have this Psychometric Test available online, so that the students across the country can take the test either from their homes, schools or cyber cafe. One such Abilities Test is available for free at MapMyTalent which also offers authentic career advice and career guidance.